Place Turbie Twist on back of head, with elastic loop on top. "Twist"
Twist hair and Turbie Twist together and place roll on top of head. "Fasten"
Pull tip of roll through the elastic loop. Now Turbie Twist will stay in place. Better than a bath towel. It looks better, stays better, even feels better! 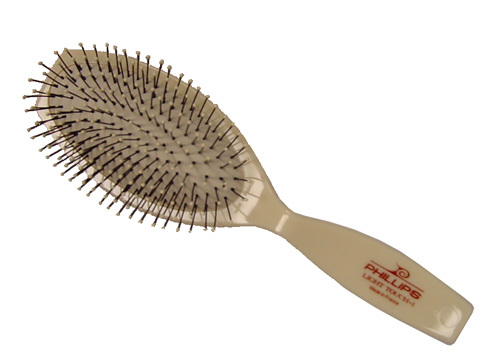 The extraordinary new hair towel that you slip over wet / dry hair ... then twist, loop and it's there to stay! 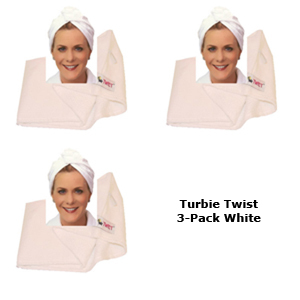 Turbie Twist's tapered design allows a perfect fit on your head. It's made of 100% cotton yet it's lightweight, not bulky like a bath towel. 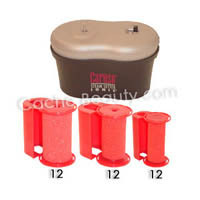 The unique non-slip twist and loop system stays in place. 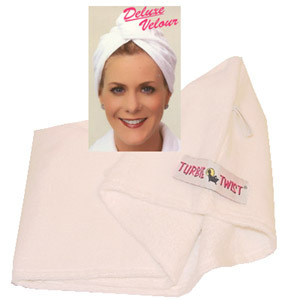 The Turbie Twist is attractive, functional, and so comfortable that using bath towels to wrap your hair becomes obsolete.